Be the first to share your favorite memory, photo or story of Mr. Arbert . This memorial page is dedicated for family, friends and future generations to celebrate the life of their loved one. 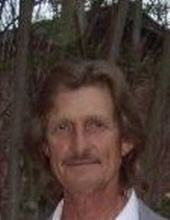 Mr. Arbert Thomas “Tommy” Boatwright, 64, of Bath, SC, entered into rest on Monday, April 3, 2019. A lifelong area resident, he was a son of the late Arbert James and Eva Mae Evans Boatwright. He was a member of the Full Gospel Redemption Center, where he had formerly served as an Usher. He was a former Ironworker. Tommy enjoyed fishing, making knives and working on his beloved GTO. In addition to his parents, family members include his children and their spouses, Karen Krueger, Aiken, SC, Jenny and Jeff Bates, Aiken, SC, Heather and Foster Crowder, Bath, SC and the late Arbert Thomas Boatwright, Jr., brother, the late Michael "Mike" Boatwright, grandchildren, Dylan Krueger, Ethan Krueger, Alex Swearingen. Emma Crowder and Jensen Crowder and his former wife and still friend, who cared for Tommy during his final months, Lynne Ennis, Warrenville, SC. The family will greet friends on Saturday, April 6, 2019, beginning at 11 o’clock at the Redemption Center, Warrenville, SC. A Celebration of Life Service will follow at noon. Tommy’s best friend, Pastor Chris Williams will officiate. It has been requested that memorials be made to the American Cancer Society. (www.cancer.org) Visit www.HatcherFuneralHome.com to share memories and leave a message of condolence for the family. To send flowers or a remembrance gift to the family of Mr. Arbert Thomas "Tommy" Boatwright, please visit our Tribute Store. "Email Address" would like to share the life celebration of Mr. Arbert Thomas "Tommy" Boatwright. Click on the "link" to go to share a favorite memory or leave a condolence message for the family.